Having the right equipment in addition to the right people is crucial in providing good service. Already serving much of the aviation community since 1946, Consolidated in 1992 purchased a large portion of test equipment from the former Pan Am avionics and instrument shops. This opened another door of opportunity for us. along with general, corporate and regional aircraft we were servicing L-1011, DC 8 and DC 9 commercial jets. 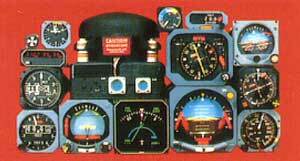 Now, many Boeing 707, 727, 737, & 747 series cockpit components could be added to our capabilities. Since then we have continued to expand our capabilities. Quality instrument service begins with meeting the stringent requirements to be a certified FAA 145 repair station. Our certificate with its number, QS2R120L has proudly been displayed for decades in our corporate literature and in our front lobby. We also are certified to European airline standards. All repaired items receive appropriate certification, such as the widely accepted 8130-3 certificate. Instrument 1, 2, 3, and 4 - Service on electrical, electronic, gyroscopic, and mechanical instruments. Radio 1, 2 (full), and 3 (limited) - Maintenance on communcation, navigation, and DME equipment. Accessory 3 (full) and 1, 2 (limited) - Adds electronic, mechanical, and other electric components. We service these instruments made by a score of manufacturers. Ametek, Bendix, Collins, Honeywell, Insco, King, Kollsman/IDC, Lewis, Sextant, Sperry, are just to name a few. We are ILS and PartsBase listed for those looking for specific items. If you are looking to purchase an instrument outright or exchange, we have hundreds in inventory! In addition to having many instruments of the manufacturers mentioned above, our inventory includes Sigma-Tek horizon gyros, Mid-Continent turn & slips, and of course our own line of Twin-Tach tachometers. Please contact us for any of the above services or products, or for a full capability list.